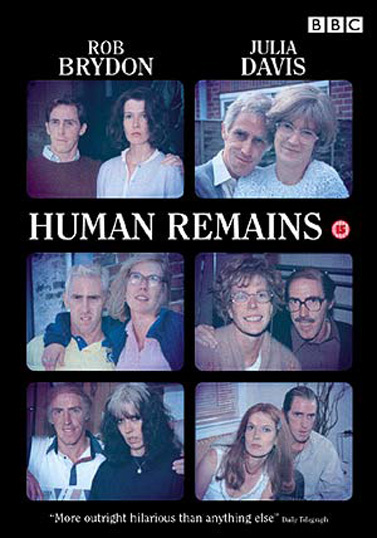 I’d be excited about anything Rob Brydon and Julia Davis were a part of, so Human Remains, wherein they play six different married couples, was at the top of my list of BBC shows to seek out while at Amoeba in LA (sadly, they didn’t have it, so i broke down and got it from Amazon UK). It’s a treat, but a very strange treat that you may not want to share with everyone – kind of like salted licorice or such. It’s funny… but not exactly funny. Like so many British comedies, it’s as dark and sad as it is humorous – though no where near as pitch black dark as Davis went on to do in Brix Pick, Nighty Night. From aristocratic twits to swinging goofballs, from paranoid Christians to wacky musicians, all of their character portraits are well developed and intriguing even as they mostly deal with depression, betrayal, and death.